Scientists have launched the largest-ever attempt to regenerate coral on the endangered Great Barrier Reef by harvesting millions of the creatures’ eggs and sperm during their annual spawning. The researchers said Wednesday they plan to grow coral larvae from the harvested eggs and return these to areas of the reef which have been badly damaged by climate-related coral bleaching. “Our team will be restoring hundreds of square meters with the goal of getting to square kilometres in the future, a scale not attempted previously,” the researchers said. The “Larval Restoration Project” launch was timed to coincide with the annual coral spawn on the reef, which began earlier this week and will last only about 48 to 72 hours. 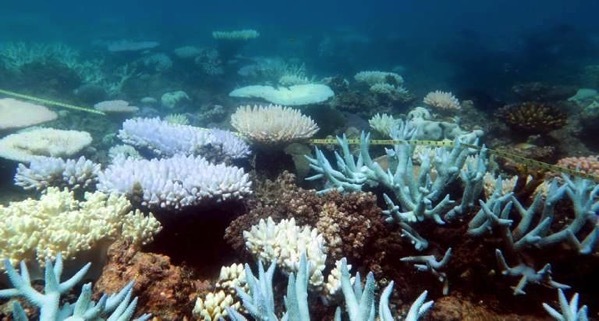 The scientists hope that coral which have survived bleaching have a greater tolerance to rising temperatures so that a breeding population produced from this year’s spawn will grow into coral better able to survive future bleaching events. This entry was posted in Global Warming, Wildlife and tagged coral bleaching, great barrier reef, reseeding, wildlife. Bookmark the permalink.